Mary was born in Arviat, formerly known as Eskimo Point, in Nunavut. In addition to carving, Mary is a talented seamstress who makes wall hangings, dolls and other sewing crafts. Mary prefers to carve with stone and does not use power tools. 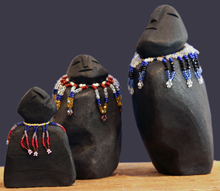 Mary feels that what makes her carving style different from other artists is the introduction of beadwork. The strongest artistic influences in Mary’s work are those of her mother, Alice Akammak, and her mother-in-law, Lucy Tutseetok. Mary learned to carve by watching them work. Mary has great admiration for Lucy’s work and her success as a carver.